My original game plan included the dream of jaunting off into the jungle like Jane Goodall. But my life has taken a drastically different path - like my primate cousins and their descendents who were captured from Africa and confined to labs. Now, since I have seen it all - I cannot forget; neither can they; and, neither should you. I first went to NYU’s primate research lab called the Laboratory for Experimental Medicine and Surgery in Primates (LEMSIP) in 1991 to check it out after seeing an article about the place in our local newspaper. 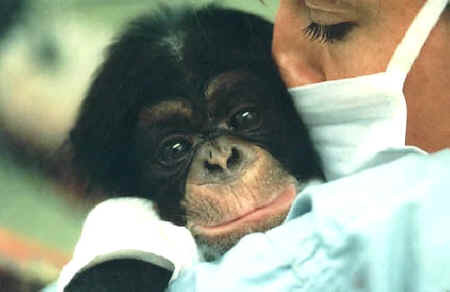 There were pictures of baby chimpanzees being rocked in rocking chairs by staff garbed in surgical masks and gowns. I had heard about LEMSIP the year before as a place that did biomedical research on nonhuman primates – monkeys and chimpanzees. I had immediately dismissed it as a place that I wouldn’t likely associate with since I had strong feelings against the use of animals in biomedical research. I was going to college to learn about primate behavior and conservation. This article talked about how some of the people who worked there, particularly the Chief Veterinarian, Dr. Jim Mahoney tried to make “the best of the worst” meaning that they tried to make the lives of the monkeys and chimpanzees there a little less horrid under the severely deprived conditions and harsh realities of the lab. They had a volunteer program, which is very unusual for biomedical labs since they typically have very “closed door” policies. I decided that I had better go and see for myself. What was going on there? What were they doing to the monkeys and chimpanzees? What kind of people worked there? …what was so humbling was how much love and affection the chimpanzees and monkeys gave to us - the humans on the OTHER side of the bars - the ones who had the keys, the ones who did everything (good and bad) to them, the ones who controlled their lives, the ones who were expecting them to withstand conditions that we would never put each other through. I was appalled and I think the public would be as well if they were aware of the wasted dollars and lives that are consumed by labs, behind closed doors, day after day, under the guise of necessary science to save our lives. Once I met and connected with those baby chimpanzees facing a lifetime in research I asked just one question: What could I do to help them? There were some good, caring people working there along with the typical spectrum of people that work in labs who unfortunately include the uncaring, lazy, uninterested, and unkind. And, typical in labs, there were simply too many monkeys and chimpanzees to be cared for by too few people as well as not enough fundamental resources like money and space, much less an abundance of psychological enrichment. I volunteered at LEMSIP against my moral judgment but with the encouragement of the Jane Goodall Institute. Dr. Goodall had been to LEMSIP and understood the plight of chimpanzees in laboratories. A year later I got a job there working primarily in the chimpanzee nursery as a caregiver and surrogate mother. I had to participate in some health and research technical work at times as well. Occasionally, I also worked with the adult chimpanzees and all of the other species of primates at LEMSIP – baboons and rhesus, java, squirrel, tamarin, and marmoset monkeys. After a couple of years of being morally torn, I consulted Dr. Goodall again. She merely said: “Those chimps need friends.” That was all I had to hear in order to dutifully continue trying to make a difference in the lab. My work at LEMSIP was an incredible and life changing experience. It was the most physically and emotionally taxing work I have ever done. At the end of each day I never felt as if I had done enough for them. I knew that I could never begin to give back what was taken from them. But what was so humbling was how much love and affection the chimpanzees and monkeys gave to us – the humans on the OTHER side of the bars – the ones who had the keys, the ones who did everything (good and bad) to them, the ones who controlled their lives, the ones who were expecting them to withstand conditions that we would never put each other through. And even more amazing was how forgiving they were. Then, NYU decided to close the lab and after five years, once the chimpanzee nursery closed, I felt that my work there was done. Most of the young chimpanzees, some of the adults, and some of the monkeys went to sanctuaries and the rest remained in biomedical research – the chimpanzees going to the Coulston Foundation. I was getting worn out emotionally and angry at the system, yet I doubt that I could have left those babies had they not left first. I have yet to recover from the loss of my deep relationships with and love for so many of the chimpanzees and monkeys that I was privileged to know and care for. They became family to me. For some it has been a happy ending and that makes me happy for them. For others, the nightmare continues. In 1997, I took a course in Africa and seeing nonhuman primates in the wild validated what I already knew in my heart – how wrong it is to “use” them in biomedical research and how urgent and important conservation efforts are to protect those remaining in the wild. Additionally, after four years of not seeing any of the LEMSIP chimpanzees, I visited Fauna Foundation (a sanctuary in Canada) and was reunited with 15 of my chimpanzee friends. Their welcome was beyond words and it was a miracle to see how far each one of them had come in their rehabilitation within the loving environment that the folks at Fauna provide. Since then I have had similar equally touching reunions with LEMSIP chimpanzees at other sanctuaries. Now my contribution must be to those still remaining in labs through efforts to get them out of biomedical research and into permanent sanctuary. 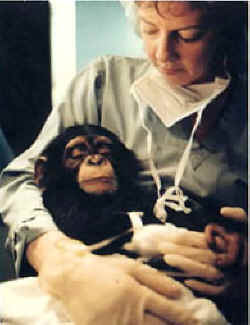 YERKES: I went to the Yerkes National Primate Research Center in February, 1998 with the notion that I could give back to nonhuman primates by participating in documenting, through behavioral research, their many intellectual, emotional, and social capabilities so that this scientific proof would persuade humans to value and protect these wonderful beings. But it didn’t work that way. I chose to work at the “behavioral field station” to avoid a biomedical environment. My experience did not come close to that dream, for Yerkes is like other labs in that the animals’ interests and fundamental rights are not a priority. I became disillusioned as each day showed that even the behavioral field station was still just a lab. The field station is the breeding colony that supplies monkeys and chimpanzees – even newborn monkeys – to various research projects there and at Yerkes’ main center where most of the invasive biomedical research takes place. Though most of the Field Station monkeys and chimpanzees are housed in variously sized groups, their housing “compounds” were pitifully sparse as compared to the complex environments where they live in the wild. Many monkeys were near bald from over grooming due to boredom. Some monkeys and chimpanzees lived in small indoor/outdoor runs and some monkeys lived alone or in pairs in cages in trailers or buildings with no windows or access to the outdoors. While I was there, there were some caring people who supported or allowed some improvements. But for 2,000 nonhuman primates the few of us vying for them could do very little. I also found that most “behavioral research” being done in labs must have a biomedical component in order to get funded. So even the behavioral research that I participated in required occasional blood sampling and similar procedures. I worked on a project that studied mother/infant relationships in monkeys. First hand observations of large matrilineal (female) related monkey groups confirmed my understanding of the richness, depth, and value of family, social support, and interactions among nonhuman primates. Social and physical contact is paramount to them, especially under the unnatural and uncertain conditions in labs where family members and friends could be here today, gone tomorrow. Witnessing the stress and grief that family members would experience whenever a mother, uncle, sister, brother, child, infant, or any relative was suddenly removed from the group forever was unbearable, especially if we knew that they were being sent to the main center for an organ transplant or to be killed (“sacrificed” or “harvested”) for some research project. Monkeys in particular seemed to be regarded as dispensable. Worse still, was imagining how afraid, lonely, depressed, and traumatized the individual who was taken felt and what was going to happen to them. It was horrible to see newborn monkeys ripped from their mothers’ protective grip leaving them devastated and calling for their babies for days. Then, once I became a mother, the practice of taking infants away from monkey moms was even more unconscionable. It became apparent to me as time went on that research is more of a business than science. Researchers are under pressure to bring in more grant money even if it means a “renewal” for five more years of something relatively unimportant (much less life saving). A mere twist or extension to what that they had just done for the last five years – to the tune of millions of dollars. Often the research projects are replications or slight variations of things we already know. The current trend is to add an invasive component to explore physiological aspects of a concept that has often already been researched (i.e. how the brain reacts to certain stimuli, stress, lead paint, or cocaine). But there has always been some justification by the labs for doing invasive research. I was appalled and I think the public would be as well if they were aware of the wasted dollars and lives that are consumed by labs, behind closed doors, day after day, under the guise of necessary science to save our lives. I truly believe that most people couldn’t do it and would want it stopped if they were the ones standing in front of a caged chimpanzee that they had come to know (and who had come to know them) while watching them languish because of something they did or didn’t do to or for them in the name of science. It’s simply just not right. Though I never agreed for a second with the use of animals in biomedical research, I went into it to try to improve the daily lives of chimpanzees and monkeys in labs through compassionate treatment and unconditional love. Due to the conditions and practices that are considered acceptable in labs, my role expanded to include psychological enrichment and advocacy from inside the system from every possible angle. I told myself that I would do it for as long as I could. But after ten years of working on behalf of monkeys and chimpanzees from the inside, I felt that I had to take my fight outside of laboratory gates, for I couldn’t stand to witness the injustices of biomedical research any longer. All the feelings and experiences were too numerous to manage anymore. I left Yerkes in February 2002. It has been a challenge to emotionally “regroup” from my experiences in labs and to convert those feelings into determination to help. The magnitude of my emotional experience has been overwhelming, but it could never come close to the emotional and physical impact that laboratory life has on a single monkey or chimpanzee during their short or long life there. Therefore, I am committed to working with Project R&R toward the elimination of biomedical research on chimpanzees while advocating for those still in research – for as long as it takes. TODAY: For the past several years, I have been working as a Behavior Specialist helping mentally and physically challenged people who have developed emotional and behavioral problems related to their disability and/or as a result of the effects of institutionalization. Some people who had been institutionalized during the years when standards of care were low suffer from Post Traumatic Stress Disorder (PTSD). The sad abnormalities of feelings and behavior that some of the people I work with demonstrate are strikingly similar to those that so many laboratory nonhuman primates develop, right down to stereotypes like self-injurious behavior and symptoms of PTSD. Like humans, the monkeys and chimpanzees do not start out with these deficits. They develop them through the inhumane conditions that people inflict on them in labs – from scientists at NIH who approve research grants to researchers to the every day people who support biomedical research with their tax dollars without question. My original game plan included the dream of jaunting off into the jungle like Jane Goodall. But my life has taken a drastically different path – like my primate cousins and their descendents who were captured from Africa and confined to labs. Now, since I have seen it all – I cannot forget; neither can they; and, neither should you. I call on all those who work or have worked with monkeys and chimpanzees in labs to come forward – in some way – to speak and act on their behalf. How will people who haven’t witnessed it fully understand the plight of chimpanzees and monkeys in labs if we don’t tell their stories? Whether inside or outside of a lab I feel a tremendous responsibility to all chimpanzees and monkeys who live, have died, and will be born or dumped into biomedical research. I didn’t ask for this responsibility but the chimpanzees and monkeys didn’t ask to have everything they were entitled to taken away either. It’s not the way I saw my dream but lab life isn’t what chimpanzees and monkeys dream of either. It’s not my job but it has become my life’s work. It’s the responsibility of each and every one of us, in all walks of life, to fix what these innocent prisoners in labs didn’t create – to give them some semblance of restitution by retiring them to sanctuaries. Please make some time for them – their time is running out. For more information on how you can help chimpanzees in laboratories, please visit ReleaseChimps.org.